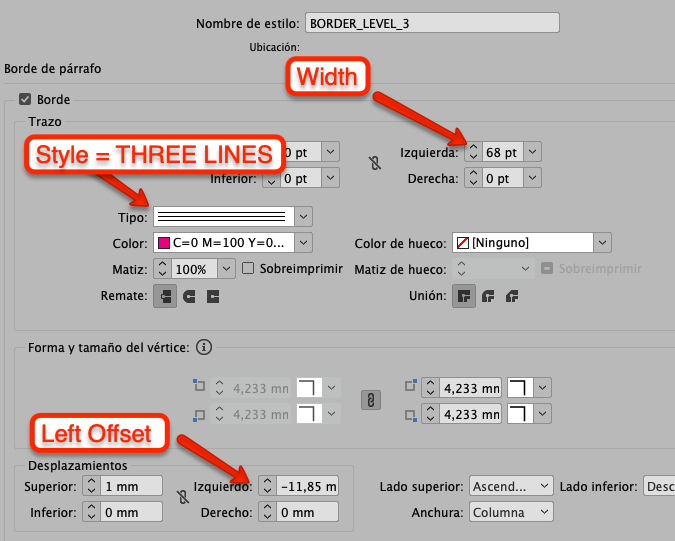 Is there a possbility to nest vertical rulers in InDesign with a Paragraph Style? How do I make this in InDesign? I have found this trick to use Paragraph Shading to use it for a single level but I don't think this is going to work with nesting. The thing is that Paragraph Shading is a CC feature, and I'm still using CS6, so I can't test it. It would be great if there is a style-based solution for this, for it's going to be used for a huge bulk of text. I'm open to CC solutions, but a CS6 one would be even greater. 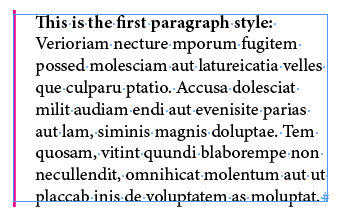 The trick is making three paragraph styles with different left indents and borders. 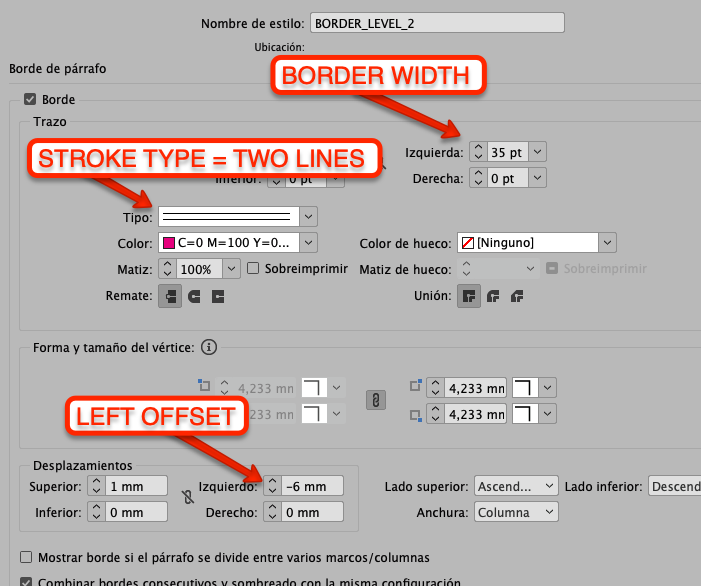 Each of these borders is one, two and three strokes that must match by setting the strokes width, the border width and the left offset. Set the first paragraph style with a left indent and a left paragraph border 1,8 pt width: BORDER_LEVEL_1 at the image. The second paragraph style has a wider left indent and a wider left paragraph border, but with a custom Stroke Type. 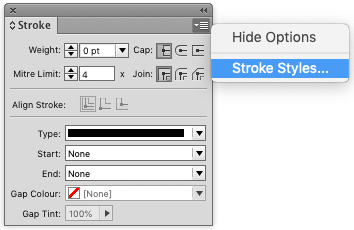 From the Stroke Panel options menu, choose Strokes Styles > New Stroke Style and create a Stripe type style with two thin lines, in this example 5% width. At the Paragraph Style, change the Border Type for the TWO LINES stroke and modify the border width and the left offset until it matches with the first paragraph border. Do the same as the second Paragraph Style, but with a custom Stroke Type with three lines. 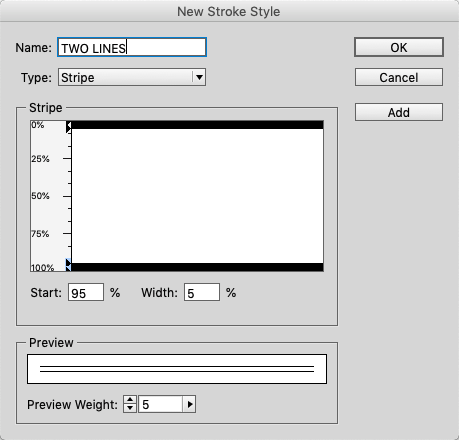 From the Stroke Panel options menu, choose Strokes Styles > New Stroke Style and create a Stripe type style with three thin lines, in this example 2,5% width. At the Paragraph Style, change the Border Type for the THREE LINES stroke and modify the border width and the left offset until it matches with the first and second paragraph borders. It may not be a simple job, you have to establish the paragraph border and stroke styles measures and percentages well, but it's something to do only once. Not the answer you're looking for? Browse other questions tagged adobe-indesign cs6 paragraph-styles or ask your own question. Are there any differences between Paragraph Shading and Paragraph atop Color? 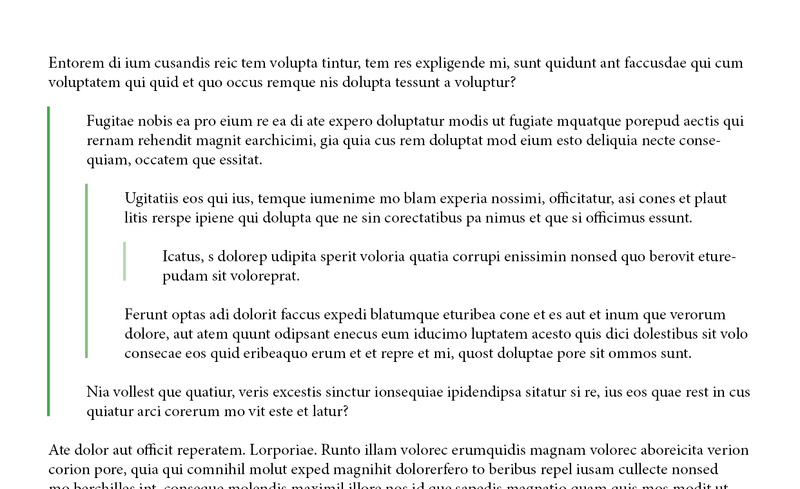 How can I have an (InDesign) paragraph style without a paragraph break (running paragraphs)? Is it possible to add some greps to paragraph style to change a section mark content?